Replacement: None. 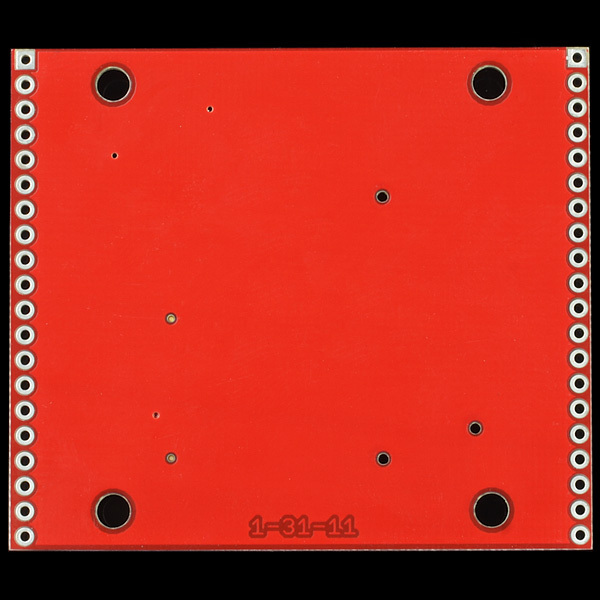 The ADH8066 module is no longer being produced so we are no longer carrying this breakout board in our catalog. This page is for reference only. This is a simple breakout board for our ADH8066 miniature, quad-band GSM module. Standard 0.1" spaced headers allow easy access to a full range of functionality. The ADH8066 is a miniature, quad-band GSM 850/EGSM 900/DCS 1800/PCS 1900 module, which can be integrated into a great number of wireless projects. You can use this module to accomplish almost anything a normal cell phone can - SMS text messages, GSM/GPRS, TCP/IP, and more! It also includes a SIM card socket on the back! Note: You get the breakout board only. Check below for the ADH8066 module, which is sold separately. Note: If you are having problems getting this wired up correctly, try looking at the links below. They show the board connected to a 3.3V FTDI board for communication over a terminal program, but could easily be interfaced with an Arduino following the same schematic. Note: This module can pull up to 2A during transmission. In order to prevent issues in your project, be sure to use an appropriate power supply that can source a larger amount of current. It also helps to make proper use of decoupling capacitors to prevent power issues. Yes, the example is correct :) And the leds are probably 1.7v. hi, anyone can tell me where to plug in Antenna on this breakout board? Thanks. Any chance of getting those back? If not, is there somewhere I can buy them? Is there a replacement product for this? Unfortunately, the module has been EOL'ed so we will not be producing any more. However, you may find some still floating around with our Distributors, or you could use the Eagle files posted above to get your own pcbs printed and populate them at home. and are there any alternatives to that module besides SM5100B (which is expensive). 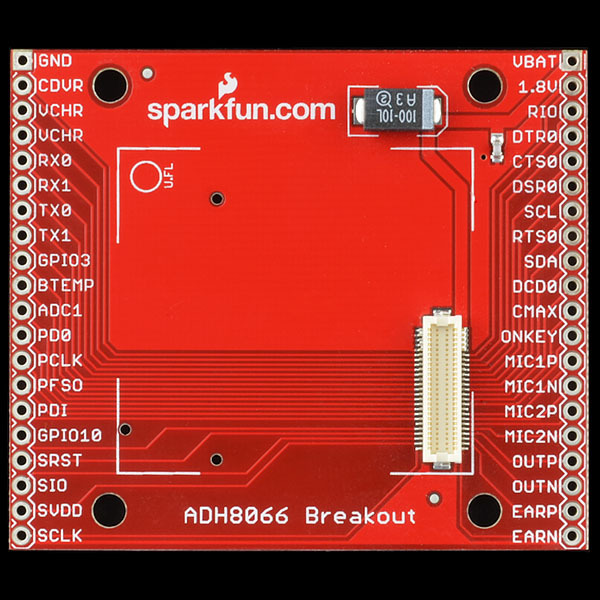 If you are just looking for the module, we did get a bit more stock in on the ADH8066 itself, along with the Evaluation board for it, but we won't be producing any more of these breakout boards. Otherwise, those are currently the only cellular modules we have. We are working on getting more modules in, including ones that are 3G compatible. You might try checking on OSPark to see if anyone else is running a panel of these pcbs. That might be your cheapest option at this point. 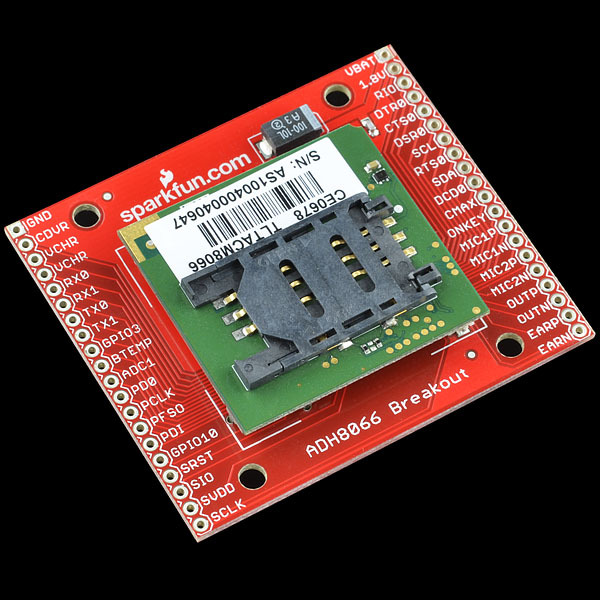 Hi, can I feed the gsm module with 3.3v? I was thinking in making a voltage divider from 5v to 4v, but I think it will not draw enough current... I just want the module to receive and send sms. Can anybody help me? Is there any voltage regulator for this or can I just use a 3.3v regulator? Hi, can anyone help, I have the breakout board but it doesn't detect the SIM card when I use the command at+cpin? an error is return. there doesn't seem to be any voltage on the simvcc pin 1.8/3.3 do I need to supply it? You will need to supply voltage on the SIMVDD pin. See schematic. I should be more specific. If you are using an external SIM card holder, then you can connect 3.3V or 1.8V to SIMVDD. But if you are using the on board SIM on the ADH8066, then I don't think you need to mess with that pin. Got my board, TY. Question: Why does the example photo linked above show the use of DTR instead of CTS that is specified in the module hardware app note? How soon for more stock? I might be happy with a bag of parts. Soldering that header is goign to be a trick for the at-home crowd. well the four pins for the SIM dont neeed to be on the edge, they could have been in the centre, in a 3rd row as they not goign to be used by nealry everyone. the sim in on the device anyway. Then there is the secondard IO port. I think challenge is not not increase the foot print of such a nice small device. Needs to be SMALLER, I want to use this device in a tiny application, it is perfect, but you BOB is too large. Can you move the pins to underneath? There isn't much they can do to make it smaller without using SMT headers. is there some wiring example of this ? Got one module, but can't get it working properly, just get "Ready" and that's it. 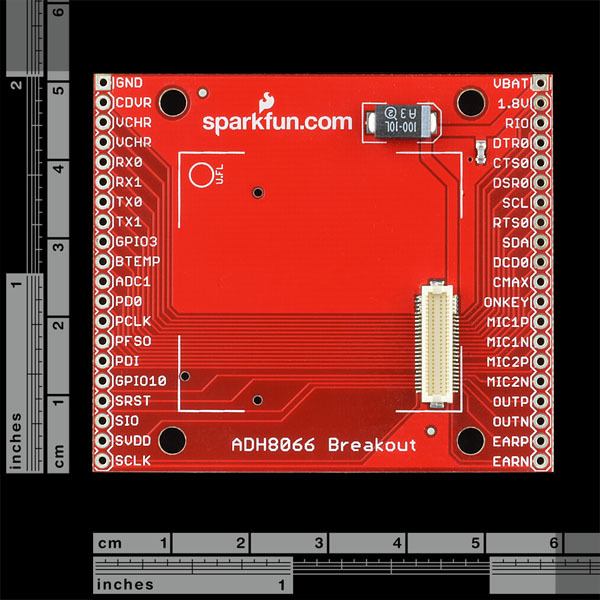 Email us with more details at techsupport at sparkfun dot com and we can help you out. you got a mail in yours box. another big board for small device. Since the module attaches to the device, it isn't actually that large. No, it's very big. The device is tiny at 1.84 in^2. 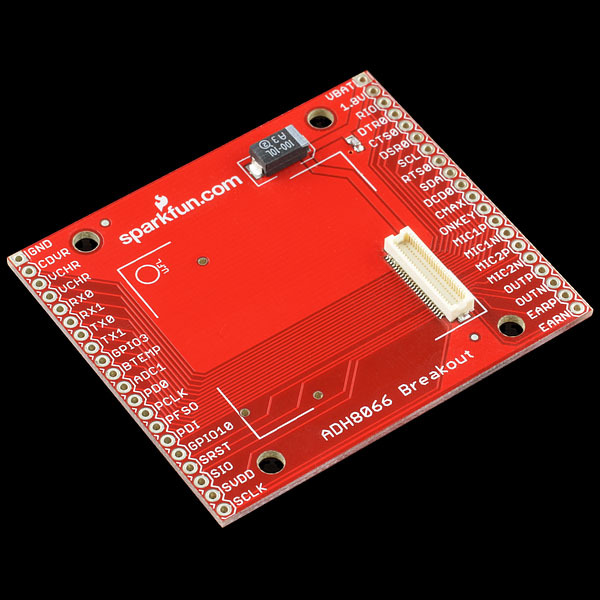 The Sparkfun breakout board is 4.6 in^2, which is 250% bigger than the module. All of the headers could be moved to underneath the device, or arranged in a square, or doubled up and placed right next to the module. The last option would take up 2.34 in^2, cutting the board area in half. The hardware guide advises against this.